The most accurate method is to measure the rough opening dimensions behind the existing registers. 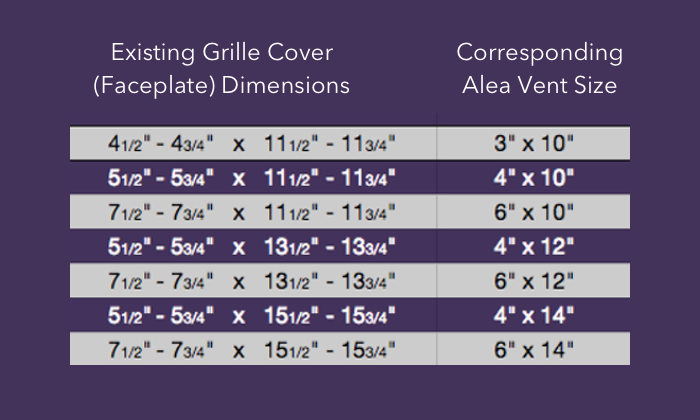 Alea vent measurements are based on the ducting size, NOT the dimensions of the vent cover grilles. 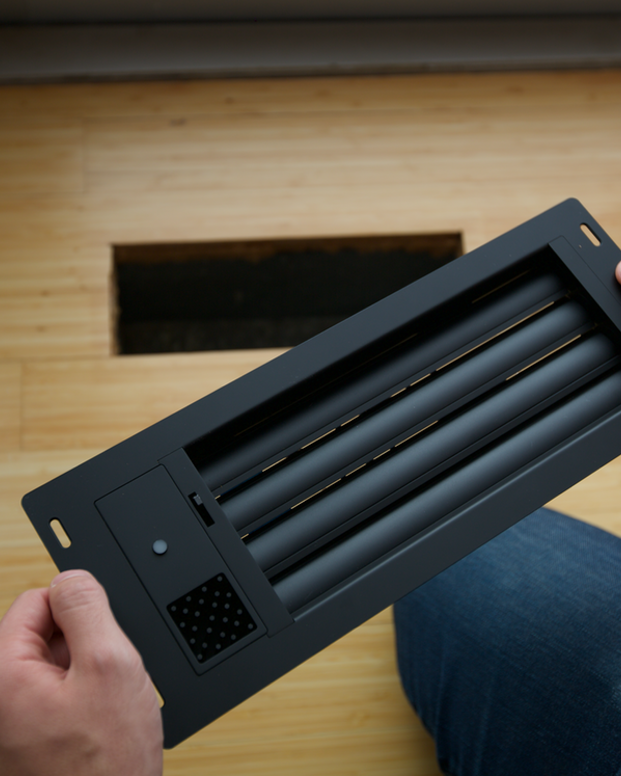 STEP 1: Remove the existing vent register in the floor, wall or ceiling. STEP 3: Order your Alea vent based on your measurements. Match the measurements to the correct Alea vent size pull down on the 'Shop'' page. • The Width and Height of your opening should closely match one of the supported Width and Height of the available Alea vent sizes. 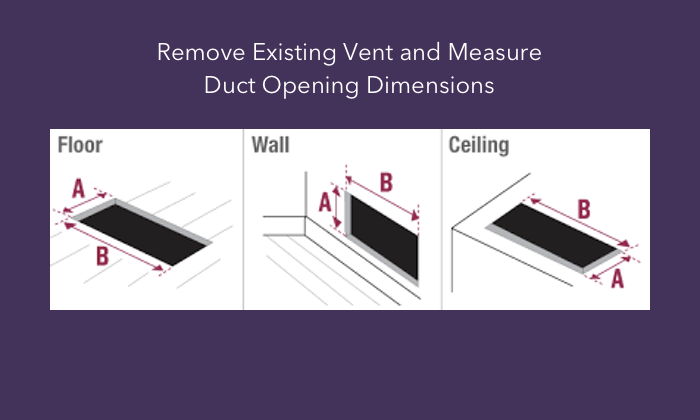 3"x10", 4"x10", 6"x10", 4"x12", 6"x12", 4"x14"and 6"x14"
It's not always easy or convenient to remove and measure the duct opening behind the existing vents. An alternative method we find works, though not as accurate, is to measure the external dimensions of the grille cover (faceplate) and then take 1 to 1.5 inches off the measurements to estimate the duct size behind the grille. As an example: If your grille cover measures 11.5 inches by 5.5 inches, your duct size would be approximately 10 inches (11.5 inches minus 1.5 inches) by 4 inches (5.5 inches minus 1.5 inches). You'd then order a 4" x 10" Alea Vent. Don't see Alea size that matches your opening? If your opening does not match one of our initial supported vent sizes, please email us at support@alealabs.com. We have designed Alea in a modular way that allows us to quickly add support for more vent sizes based on customer demand. Our second Batch 2 tooling is planned for Q3 2019 and we are considering some of these vent sizes: 10"x10", 10"x8", 12"x8", 12"x12" and 14"x8". Please send us your requested vent sizes and we'll add them to our growing list of sizes for Batch 2 consideration.